Partnerships and collaboration are a key strength of the Social Economy. It is only fitting that that research about the Social Economy also model partnership in the research relationship. The Canadian Social Economy Research Partnerships are the largest project awarded through the Social Science and Humanities Research Council (SSHRC) Community University Research Alliance (CURA) program to date. Over the last five years we have amassed significant experience in the theory and practice of community-university research partnerships. On this webpage you’ll find some of our own reflections, links to a number of organisations, and a variety of theoretical and practice (‘how to’) resources on the practice of community-university research partnerships. The goal is to demonstrate and support the immense work and diversity in this burgeoning area of practice. 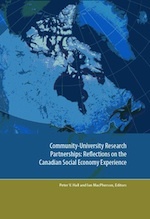 Community-University Research Partnerships: Reflections on the Canadian Social Economy Experience. Peter V. Hall and Ian MacPherson (eds). 2012. Free e-book download. What’s the difference between community-based research? Participatory action research? Community-service learning? The Trent Centre for Community-Based Education has a glossary of key terms on their webpage: www.trentcentre.ca/resources/glossary. An Outreach and Engagement Terminology in Higher Education glossary is also available through the Taillores Network at: www.tufts.edu/talloiresnetwork/downloads/OutreachandEngagementTerminologyinHigherEducation.pdf. here to access the paper. Exploring practitioner-university engagement through research: the Social Economy Research Partnerships by Peter Hall, Janel Smith, Aliez Kay, Rupert Downing, Ian MacPherson, Annie McKitrick. Paper presented at the Association for Non-profit and Social Economy Research (ANSER) conference, Carleton University, May 27-29, 2009. The Québec node of the CSERPS (ARUC-ES) and the Réseau québécois de recherche partenariale (RQRP) have produced a video on the role of partnerships in research on the Social Economy. It is available in French, and is available on their website: http://economiesocialequebec.ca/?module=document&division=26&uid=1035. The French title is: A la croisée des savoirs: 10 ans de recherche partenariale en économie sociale. CCEDNet paper: Issues of Research Policy, by Eric Shragge. August 2004. Click here for the paper. The CSEHub produced this questionnaire to encourage reflection on our own partnerships practices. Click here for the document. This new and developing network was formed in 2008 to help meet the needs of people and communities. CBRC came into being through the Community University Expo Conference held in Victoria, BC in May of 2008. The CBRC also hosts the website for the Global Alliance on Community Engaged Research. The main objective of the Alliance is to facilitate the sharing of knowledge and information across continents and countries to enable interaction and collaboration to further the application and impact of community-based research for a sustainable just future for the people of the world. The Carnegie Foundation for the Advancement of Teaching (American) offers the following, widely used definition of community engagement, "Community Engagement describes the collaboration between institutions of higher education and their larger communities (local, regional/state, national, global) for the mutually beneficial exchange of knowledge and resources in a context of partnership and reciprocity". Since 2006, the Carnegie Foundation has been collecting data on community engagement in institutions of higher learning. Participation in the program is elective (unlike the Carnegie Basic Classification) and interested organisations complete a survey that assesses various aspects of their community engagement. The Foundation identifies three elements of community engagement: curricular engagement, outreach and, partnership. Institutions can be classified as exhibiting one or all of these elements of engagement. Community-Campus Partnerships for Health (CCPH) is a nonprofit organization that promotes health (broadly defined) through partnerships between communities and higher educational institutions. Founded in 1996, we are a growing network of over 1,800 communities and campuses across North America and increasingly the world that are collaborating to promote health through service-learning, community-based participatory research, broad-based coalitions and other partnership strategies. These partnerships are powerful tools for improving higher education, civic engagement and the overall health of communities. Loka’s visions is “to kindle a vibrant popular movement for community-driven policies in research, science, and technology that will advance democracy, social justice, and ecological sustainability at every level - from neighborhoods to nations”. The Loka Institute used to sponsor a, now dormant, trans-national CBR Network. However, the website is still home to a bibliography on CBR. The Living Knowledge Network is the international network of Science Shops. The Science Shop tradition began in Europe and its influence has spread across the globe. Science Shops carry out scientific research in a wide range of disciplines – usually free of charge and – on behalf of citizens and local civil society. The fact that Science shops respond to civil society’s needs for expertise and knowledge is a key element that distinguish them from other knowledge transfer mechanisms. Science Shops are often, but not always, linked to universities, where students conduct the research as part of their curriculum. Based in France the Citizen’s Science Foundation seeks to democratize knowledge, re-placing it in the hands of citizens. The Talloires Network is an international association of institutions committed to strengthening the civic roles and social responsibilities of higher education. The Taillores Network grew out of a 2005 conference that brought together the heads of universities devoted to strengthening the civic roles and social responsibilities of higher education. Participants developed the Taillores Declaraction on the Civic Roles and Social Responsibilities of Higher Education. Signatories of the Declaration have committed their institutions to educating for social responsibility and civic engagement, and to strengthening the application of university resources to the needs of local and global communities. The Taillores website is a wealth of information, hosting: institutional profiles and case studies, online resource library, e-newsletter, a blog, a database of civic engagement experts, and student resources. AUCEA is committed to fostering university-community engagement throughout Australia and the Asia Pacific region. We aim to achieve excellence in university teaching and research, further develop communities, and shape our future citizens by working together – within and outside the higher education sector. This is a developing network in Sub-Saharan Africa. Check back for more information from them. Campus Compact is a national coalition of more than 1,100 college and university presidents - representing some 6 million students - dedicated to promoting community service, civic engagement, and service-learning in higher education. Campus Compact acts as the secretariat for the Research University Civic Engagement Network, which has produced a Toolkit for Engaged Research. The ACU University Extension Network brings together practitioners in community engagement, outreach, knowledge mobilisation, and extension activity. The network was launched at the University of Ghana in April 2008, and comprises around 450 individual members. The ACU University Extension Network provides a forum for the exchange of good practice in extension, helps to disseminate knowledge and project management skills amongst practitioners across the ACU membership, and relays relevant news and opportunities for collaboration to its members. Society for Participatory Research in Asia (PRIA) is an international centre for learning and promotion of participation and democratic governance. Since its inception in 1982, PRIA has embarked on a set of key initiatives focusing on participatory research, citizen-centric development, capacity building, knowledge building and policy advocacy. Gateways is an online electronic journal concerned with the practice and processes of community engagement. It provides a forum for academics, practitioners and community representatives to pursue issues and reflect on practices related to interactions between tertiary institutions and community organisations; academic interventions in community; community-based projects with links to the tertiary sector and community initiatives. The journal publishes evaluative case studies of community engagement initiatives, analyses of the policy environment and theoretical reflections that contribute to the scholarship of engagement. JCES is a peer-reviewed international journal through which faculty, staff, students, and community partners disseminate scholarly works. JCES integrates teaching, research, and community engagement in all disciplines, addressing critical problems identified through a community-participatory process. And while the academic community knows what that means, many readers we want to reach, including many well educated people in the public, do not. We want people to understand what research is, regardless of background or level of education. This means that we aim to reach not only professional scholars but also undergraduate students, community partners, and the general public. So JCES began with the goal of being “a different kind of research journal” because there is a need for such a journal. The Journal of Community Engagement and Higher Education: a new on-line, refereed journal examining perspectives, research, and practices of community engagement and community-based learning in higher education. The journal is published semi-annually by Indiana State University’s Center for Instruction, Research, and Technology. Australasian Journal of University-Community Engagement: http://aucea.com.au. This journal is published Australian Universities Community Engagement Alliance. The Journal of Higher Education Outreach and Engagement is a joint publication of the Institute of Higher Education and the Office of the Vice President for Public Service and Outreach of the University of Georgia. It serves as a forum to promote the continuing dialogue about the service and outreach mission of the university; and seeks to foster understanding of how the service and outreach mission relates to the university's teaching and research missions as well as the needs of the sponsoring society.